The bottle said: Excellence Creme: Nourishing Color. The woman on the label had smooth, shining brown hair and a lot of very white teeth. At the bottom, a little banner promised the contents would banish unsightly greys with just one application. “Okay, but unsightly?” Kakashi rumpled his hair, trying to affect the tousled bedhead look that was somehow more desirable than actual bedhead. It made no perceivable difference, except to add more static lift. Punting one of your summons into the toilet probably broke several key contract points, but Kakashi was still tempted. He distracted himself by reading the instruction booklet. It came with a tiny brush and plastic gloves, and several warnings about putting petroleum jelly on his forehead to avoid permanent skin staining. People did this for fun? It was a mission requirement. He got on with it. First step: mask off, towel around shoulders. Second step: petroleum jelly applied to forehead, ears, and nape of neck. Third step: plastic gloves. Fourth step: shake bottle, apply contents. The brush was just for highlights, apparently. Fifth step: massage dye in thoroughly, cover with plastic wrap, wait forty minutes. It was cold and it stank. He sat on the closed toilet lid and read Icha Icha, quoting the funnier bits aloud for Pakkun’s snickering benefit. Sixth step: Shampoo hair, dry and style. The sink looked like a dirt monster had exploded in it, and three of Kakashi’s towels were stained brown. He stared at the mirror. The final effect wasn’t anything like the sleek, glossy model on the bottle. He looked like an electrocuted brown dandelion. Pakkun regarded him with sad, solemn pug eyes, and rolled over laughing. His tiny legs waved in the air. Pakkun didn’t even make an effort to escape the towel. He sounded like he was snorting flannel. Kakashi judged his predecessors so much for failing to make ‘summoners will not be mocked by fluffy cretins’ part of the contract. Reluctantly, he looked at his reflection again. The face looking back, never exactly tan, was now the approximate color of salt. The grey eye was pale. He didn’t open the other one. His eyebrows floated under the sea of brown like weird grey afterthoughts. By any measuring stick, he looked utterly stupid, and he smelled like a chemical factory. But he didn’t look like himself. And he didn’t look like Sakumo. The bottle went in the trash, along with the ruined towels. He scrubbed the sink out, aired the bathroom. His hair fell into his eyes, caging the world with brown bars; he raked the top part back with an elastic band and ignored Pakkun’s renewed howls. Put on a cotton allergy mask, to get used to the feel of it for the upcoming mission. The naked edges of his jaw made him feel twitchy and irritable. Hiding — sulking — under the bedcovers for the rest of the day was an appealing thought, but it didn’t serve the mission. He put on his civilian outfit — rough pants, peasant shirt, eyepatch, scuffed boots — and forced himself out for a test run. There were a few sections of Konoha that had made their opinions on him and his lineage extremely clear. He toured them twice and bought a dozen apples. No one spat at his feet. While Pakkun trotted down from his rooftop perch to pee on a few choice targets, Kakashi cut across town to his favorite bookshop, where he could test a more familiar target and maybe sit in a soothing dark corner behind the books. Punting Hakone probably violated some unwritten ANBU contract, too. But still, tempted. “Thank you,” Kakashi said instead, with dignity, and stepped around them to pursue his goal of dark, friendly book spaces. Hakone’s mouth curled in frank amusement, as if Kakashi has said something clever. 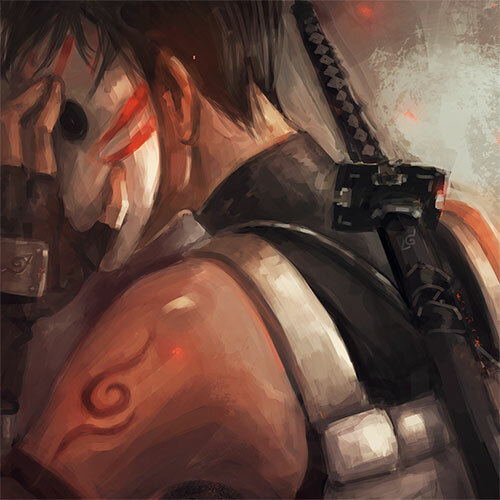 Kakashi’s total knowledge of him was: ANBU, torturer’s son. Someone who spent time with Ryouma. Punting: becoming more tempting. “They’re judging your taste in weaponry, too,” Kakashi said. “See you on the other side,” Ryouma said, with a flickering smile. Hakone’s mouth curled again, his eyes lingered briefly on Kakashi, and he slipped away. Kakashi’s shoulders eased down a half-inch. At this point, Kakashi was considering shaving himself bald. He was also wondering why Ryouma had traded Hakone’s more entertaining company for Kakashi’s radiating crankiness. Masochism, probably. Ryouma had a problem. So helpful. Kakashi sighed and snapped the stupid elastic. His hair fell across his eyes again, kinked and slightly wavy. He needed a hitai-ate, but that was the exact opposite of anonymous. “What’s wrong with grey?” he asked, abruptly. Another point against the allergy mask: it did nothing at all to hide the edges of Kakashi’s face turning red. “I’m not worried. It’s just— a thing I read.” A completely unimportant thing that didn’t relate to the mission, or any mission, and didn’t actually matter, and was also a question that Ryouma had completely failed to answer, which was a broad tell from a man who treated tact like an optional garnish, but whatever. Kakashi yanked the mask higher on his nose and thought, Books. Books made everything better. Ryouma, frowning, opened his mouth again. Watching his broad shoulders disappear into the crowd, Kakashi resisted the urge to slap a hand over his face. Minus ten points for all around failure, Hatake. A warm, furry presence settled on his foot. “That was awkward,” Pakkun said. “I will pay you to stop talking,” Kakashi said. Pakkun made an amused sound, like a rumble pulled through laughter, and pressed his side briefly against Kakashi’s ankle. He trotted towards the bookshop, miniature cape flapping in the light breeze. Kakashi trailed after him. He bought another bottle on the way home, to dye his eyebrows.